A zoomable display of relationships among institutions due to the exchange of large quantities of money between them as reported to IRS in a decade of Form 990 tax filings. After gazing deeply into the network a while, a few things begin to pop out. One is that, at least when we look at the strong ties, the network is broken into two parts. We can see a small strongly funded island of the Ave Maria Foundation which is fairly independent from the larger continent of conservative philanthropy. The single biggest grant in the database —$73 Million in 2004 to fund start up and construction of Ave Maria University — appears in this cluster. Although an additional three of top ten largest grants appear in this island in subsequent years, it actually represents a small fraction of the overall activity in the more connected portion of the network. The larger portion network is much less dense, with a median grant size around $20,000 and discernible segmentation into various 'regions'. The Walton Family Foundation, by far the largest donor, appears to have its own sphere of influence which is somewhat independent from the territory inhabited by the Richardson, Bradley, Olin and Scaife foundations. It turns out that these are often refered to as the "four sisters" in philanthropy articles because of their close linkages and giving patterns. The major conservative think tanks appear more in the larger cluster, with the Charter School and education reform institutions tending to be linked to the Waltons. However, key groups like the Heritage Foundation, Hoover Institution, and Manhattan Institute appear centrally located, receiving strong support from all camps. Zooming in on the graph reveals a strong commitment to funding programs in educational institutions scattered throughout. 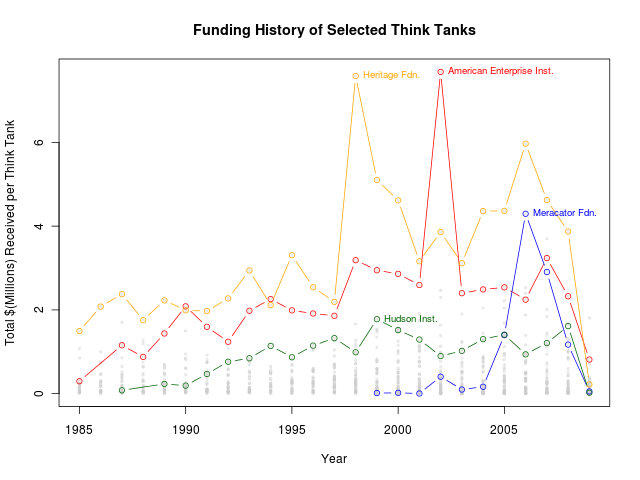 There is some historical evidence (see the "Powell Memo") that this is a result of an explicit strategy funding of Political Science, Economics, and Law departments in major universities in order to shape the future political ideology of the U.S.
A close up view of the Heritage Foundation and its key funding institutions. Of course there is also consistent funding for more traditional non-controversial charities like the YMCA, Boys and Girls Club, Salvation Army, Boy Scouts who also land together in a cluster. There is also a continuing commitment to "classic philanthropy" with lots of small gifts to highbrow Arts such as theatres, symphonies, orchestras and musuems. Most of which are too small to show up in this diagram but a notable exceptions is the massive grants to the Crystal Bridges Art Musuem. Perhaps surprisingly, there are a number of Environmental groups appearing in the network. An interesting feature of the map is that a number of the larger foundations, Gilder, F.M. Kirby, Richard and Helen DeVos, and the Walton Family foundations, seem to have the greater portion of their giving focused "outward". In other words, although most of them do give money to central institutions like the Heritage Foundation, many of the groups that they fund most strongly appear not heavily funded by other groups in our sample. Contrast this with the cluster around the Sara Scaife, John M. Olin, John Templeton, and Lynde and Harry Bradley foundations, who seem to have a set of strongly overlapping grantees. The Koch brothers, who have received considerable press for their "secretive" funding of conservative groups like the Tea Party, make somewhat modest impact in this network. The three Koch-controlled foundations, David H Koch Charitable Foundation, Charles G. Koch Charitable Foundation and Claude R Lambe Chartitable Foundations, do tend to tend to land in the same region of the network, and contribute to some of the most strident free-market think tanks. They also include one of the few cases in this network of a foundation reporting direct contributions to another, a $20 million grant from D.H. to C.G. Koch foundation. It seems likely that they make their policy weight felt through business and personal political contributions which do not directly appear in the foundation universe. The biggest problem with this tool is that we don't actually know how the underlying data was collected. This is important because we are really looking at a tiny sample of organizations that are part of the vast web of non-profit funding in the United States. Foundations in the U.S. give around $50 Billion annually, this network map displays less than 1% of the total. Imagine for example that the original researchers had set out to only collect information about groups that gave to Charter Schools. If so, it wouldn't be very surprising if Charter Schools showed up in the middle of the network would it?. In this sort of survey, it is always hard to tell if organizations are missing because they really didn't make contributions, or just because nobody had time to record the data from their financial statements into the database. Several sources mention the Adolph Coors Foundation as an important funder of the conservative agenda, yet they do not appear in this database. Why not? Compared to what? This network may be intriguing, but how is it different from the networks of giving that support other ideologies and causes? More specifically, if we were able to compare to a network of left-wing groups, would it be more decentralized? Fewer large donors? Is George Soros a balancing equivalent to the Walton Family or the Kochs? What organizations and sectors are supported from multiple political perspectives? Another important thing to remember is that the total funding we report for many of the organizations in the diagram is probably underestimated because we don't have all of the contributors in our sample. In other words, the nodes in the network diagram are sized by how much money they received from other nodes in the the database because we don't have the figure for their actual budget. Maybe they received other large grants from institutions we don't know about. In some plant varieties it is possible to induce the shoots of a well established tree to take on the appearance of new saplings. The new plants are essentially clones of the original, and will grow up with similar properties and characteristics. 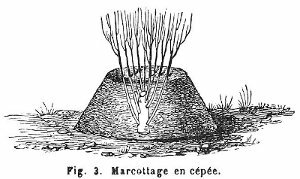 The offshoots are initially connected underground to the original trunk, relying on the parent's deep root system to provide them with sustenance and hardiness beyond what is ordinarily available to a new seedling. Animation of changing grant structure in the Right-wing Foundation Core: 1998-2008. Actually, at this coarse level of detail, we were not able to detect any interesting trends that stood out above the level of uncertainty in the data. Certainly the overall level of funding seems to have increased. And the animation seems to show a mild trend towards increasing density, which suggests that its not just that foundations give more to the same grantees. Some institutions are consistently well supported at levels far above the rest. And, if the data collection is accurate, it seems like there are some remarkable windfall years for some of the major groups. Several sources claim that one of the distinctive features of conservative philanthropy is its depth of commitment to funding for the long term. Meaning that instead of funding a specific project for a single year with well-defined deliverables, the Right tends to provide long-term operational support for ideology-based institutions which are then free to invest and adapt their programs as they see fit with an expectation of future results. Since we don't have a Left oriented data set for comparison, we can't examine the claim in detail. But we can report that the average funder-grantee relationship in this time period lasts for 2.7 years, with 18% of relationships lasting 5 years or more. The 200 or so relationships which lasted the entire time period include a mix of charities ranging from the central conservative think tanks to theatre groups. Media Matters Action Network Conservative Transparency project, the source of much of the underlying data. The Foundation Center has great resources, including tools to look up foundation IRS filings. The nodes (organizations) in this network map are located according to their funding ties by a network layout technique which tries to position strongly-tied nodes closer together. 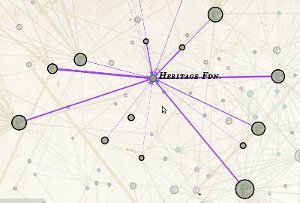 In this kind of view, nodes which are near each other on the map tend to have similar patterns of connections. The ties between nodes are created in proportion to the value of the grants the organizations have reportedly bestowed. The original set of conservative foundations and their grants to organizations was created using data from Media Matters Action Network Conservative Transparency project. Most of the organization profiles also come from MMAN, although some have been edited and augmented with excerpts from Wikipedia and the organizations' own websites. MMAN appears to have acquired the database in 2008 from the now-defunct blog Cursor, Inc. Presumably the data was entered by laboriously examining the IRS 990 report forms for the non-profits, available through sites like the Foundation Center. Unfortunately we don't know what criteria were used to select which organizations are included, which makes it difficult to make any strong conclusions from the data. These sorts of databases are also expensive to maintain, and it appears to have mostly languished since 2008. After receiving permission from MMAN to play with the data, Skye invested a great deal of time matching up the names of contributing companies and doing other kinds of data massaging and cleaning. Deciding which organizations to merge is often tricky, undoubtedly many were missed. The general rule followed was to merge organizations into their 'parent' institution whenever possible, assuming they will have similar ideologies and agenda. So, for example, the various state and local chapters of the American Red Cross are all grouped together in order to simplify the network. The names of the specific organizations can still be viewed in the grant detail window by clicking on an edge. Organizations with less than $5 Million total over the ten years, and all grant relations with an aggregate total of less than $250,000 have been removed from the network. Not showing these elements discards some important information, but without the simplification the network is too visually dense to be legible. This is also why the labels and many of the lighter-weight edges are only shown on high zoom levels or when a node is selected. Although some of the data in the collection is as recent as 2009 and goes as far back as 1985, we are only using the the decade from 1998 to 2008 that appears to have the most consistent coverage. We presume that the number of orgs with contributions recorded reflects the number of filings that researches extracted data from. The largest value is 39 in 2001 and 2006. Although 2008 was surely a rough year for foundations, it is hard to measure because it seems like a bunch of data is missing for 2009. 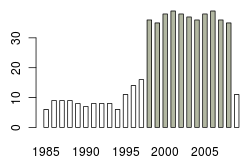 Chart shows the number of funding organizations appearing in the data each year, with decade of interest in green. The tagging of organizations with the various categories was done by Skye, using several sources. Think-tanks were matched with lists compiled by FAIR, NAIRA and VoteSmart. Education related organizations were mostly tagged using batch searches for terms like "University" and "School". Charter School related groups were tagged by searching for relevant terms in organization names, and then checking the websites or other online sources to cross-reference. Many of the EIN numbers needed to create the link to the IRS filings came from MMAN source data, but several hundred were added by manually searching against the Foundation Center listings.